Another non-surprise, but it was still nice to get our first glimpse at the upcoming Mario Kart 8 for the Nintendo Wii U. The trailer shows off the return of bikes, as well as hover cars that ride along roller-coaster like tracks! Is this Mario Kart, or F-Zero?! 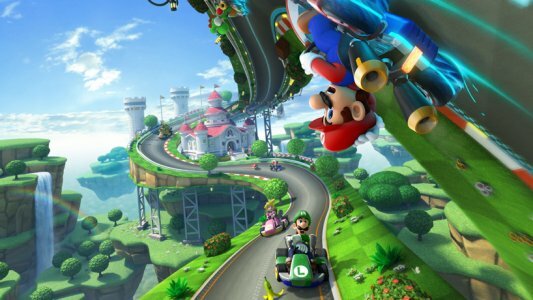 Mario Kart 8 is currently slated for a Spring 2014 release. Check out the trailer below, and stay tuned for more media and details on Mario Kart 8! Love the gravity defying tracks and the HD visuals sure look sharp. Looks slick. It's basically a combination of Mario Kart Wii and 7, and as long as they don't gimp the online modes, I'm sure I'll put in another 100+ hours into this one. This is what I dreamed Nintendo could do with HD. Wish they went the Galaxy STYLE instead of 3D Land style. Gameplay wise I mean. 4 playable characters is still pretty awesome though. DKCR2 seems a little phoned in. Where's the Wave Race, F-Zero, an Starfox?? Oh well. I'm not disappointed. More like mixed reaction. I got a serious F-Zero vibe from this game. I'm not sure Nintendo really sees a point to F-Zero anymore. This looks kind of awesome. If they really are going to kill F-Zero, I really hope they have a super-fast class, though. And some more variety in the single-player. According to Nintendo's site, you can submit highlight videos to Miiverse, whatever that means. Also, we're back to 12 players again. I'm liking this more upon a rewatch (I think I was still trying to process the new Mario game when I first saw this, and Nintendo's iffy Direct stream was throwing me off). The visuals are actually really slick, and the hovercar idea is a nice one. Can't wait to see Rainbow Road with this concept! There's GOTTA be a Mario Galaxy-themed stage now, right?? Alright, good to see Miiverse evolving like this. Photos, Art Academy app pictures and now video. Very cool! I'm really into this. It combines my two favourite Mario Karts, and looks pretty to boot! Looks great! My question is: are they giving us online free-for-all balloon battle? Mandatory team battles on Wii killed me. Looks good. A little rote but slick nonetheless. I'm really digging what I see here. Fun looking track designs and it looks really nice. This is what I expected out of Nintendo. This is the one thing shown that didn't make me pause. The anti-gravity thing looks really neat, and a great way to expand track designs. 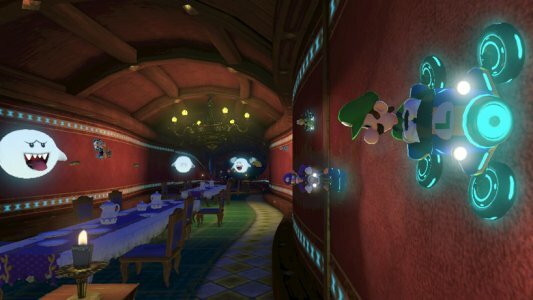 Sleep-deprived as I am, I first thought they were just showing goofy sideways and upside-down camera angles... and then it hit me that they were driving on the walls. There's still more I need to see, but for now, game looks great. It's pretty crazy how some shortcuts or different routes are right next to each other at 90 degress. Interesting to note that not one item was shown in the trailer. Are those pics in the op target renders?? This is so far probably my game-of-show for E3. Is it more of the same? Yeah. Was it obvious and expected? Well, yeah. Logically I shouldn't be as excited as I am, but MAN did that trailer look fun. Mario Kart in HD, baby! Can't wait!! This really does look very good, and it's all running at 60fps too. The lighting has the glorious sheen of Nintendoland. It almost looks like deferred rendering - but whatever is going on it looks great.